"As long as nothing interrupts that serenity, then there's nothing more magical." 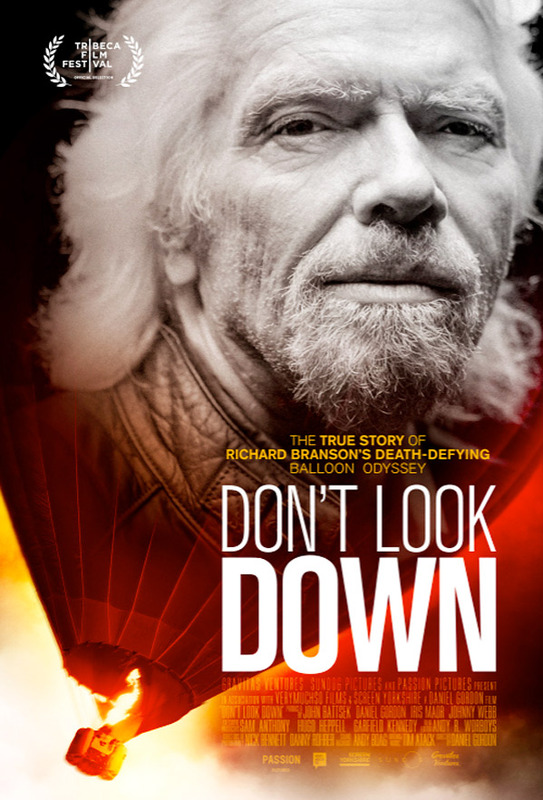 Gravitas Ventures has debuted a trailer for a documentary titled Don't Look Down, profiling the early 1980's publicity stunt by Richard Branson in an attempt to bring attention to his newly launched Virgin Airlines. Branson decided to hop in a hot air balloon and fly across the Atlantic Ocean, something that has never been done before and is considered dangerous even by other experienced balloonists. "The real story of this incredible adventure has never been told, and using intimate interviews with Branson and the team, never seen before archive (including footage from inside the balloon, shot in real time)." It looks quite thrilling and fascinating. Enjoy. It's 1984, and Richard Branson, a maverick British music mogul has just made a big decision- to take on British Airways, and set up his own airline. But with just one plane, a minimal marketing budget, and a flair for self-promotion, he quickly realizes that in order for the airline to survive, he needs to pull off a major publicity stunt… Don’t Look Down reveals the story behind Richard Branson's daring adventures trying to break world records for flying in a hot air balloon. It tells a story of courage, determination, despair and ultimate triumph. Don't Look Down is directed by filmmaker Daniel Gordon, of many sports docs previously like A State of Mind, Crossing the Line and The Game of Their Lives. Gravitas Ventures will release Don't Look Down in select theaters + on VOD starting November 11th this fall. Anyone interested? Seems cool. I'd like to know what goes on that private island of his though!! That's why I want to get rich. I want to fly to the moon with a willy Wonka Balloon.